If there is one thing that I love more than moist chocolate brownies, it’s strawberry brownies. There is just something so satisfying about biting into a moist soft batch of strawberry brownies. And the best part is they are super easy to make and only require a few ingredients! These brownies are perfect for an afternoon snack, a bake sale or just because. 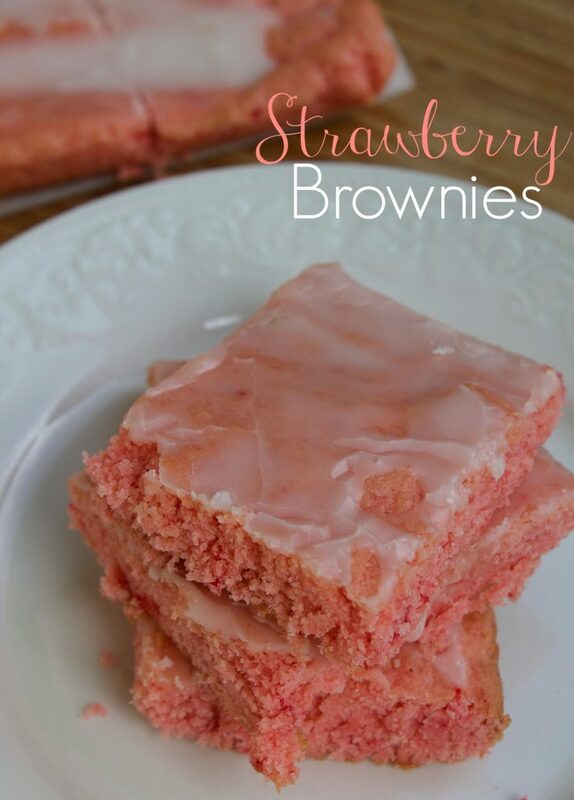 To make these yummy strawberry brownies the first thing you want to do is to preheat your oven to 350 degrees. Next line a 9 X13 baking pan with Parchment paper. You don’t have to use parchment paper but it makes it easier when you take the brownies out of the pan. Now is the fun part! Making the strawberry brownies. In a large bowl mix the cake mix, oil and eggs together with a mixing spoon. Make sure you don’t over mix them or they will be tough. The batter is going to be very thick, that’s OK! You want it to be a thick consistency because it’s brownies! Take the brownie mix and spread it evenly on the bottom of the cake pan. Just a reminder that the batter is thick so you are going to have to really spread it out using the bottom of a spoon. Now bake the brownies in the oven at 350 degrees for about 15 minutes or until the top is golden brown. Let cool for 10 minutes. 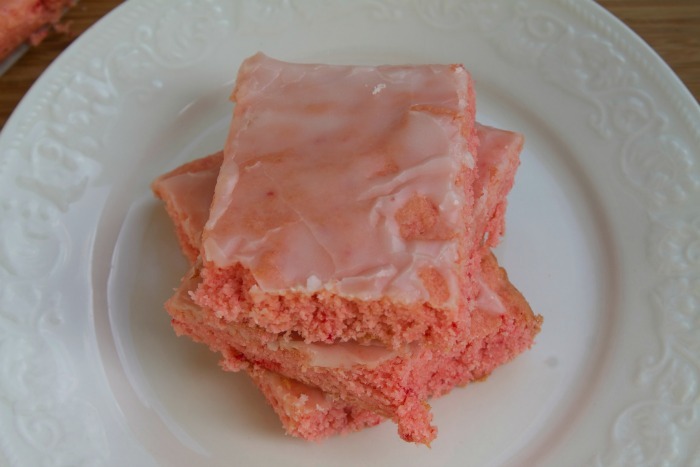 While the brownies are cooling you are going to make your strawberry brownies glaze. To do this simply mix your powdered sugar with the almond milk. Add a little bit at a time until you reach your desired consistency. Pour the glaze all over the top of the strawberry brownies and let set for about 15 minutes. Cut into small squares and enjoy.